The most simple description of Teeth Grinding is when you rub your teeth together and consequently wear down the enamel. While most people think this only happens at night, it can also happen during the day. In order to properly determine how and when you grind, Dr. Woodside will take a look at your bite, the wear on your teeth, and ask you questions about your symptoms. If you uncover that you’re not grinding during the day, you are likely grinding at night. Grinding at night can be more serious, and event lead to obstructive sleep apnea. Obstructive sleep apnea occurs when the tongue relaxes and blocks your airway. This results in loud snoring and/or your body waking up to breathe. It’s important to remember that you can have apnea or a sleep disorder without snoring without audible side effects. 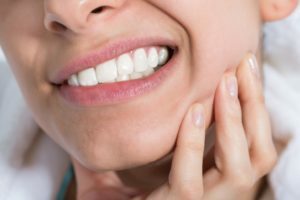 Who is most at risk for grinding and malocclusion? While there is no science to when you might start grinding, it is often discovered around 35-40 years of age. How do you know if you’re grinding? Many people grind and don’t know it as you may not have any symptoms at all. Your teeth, muscle and joints all work together, and the slightest imbalance can cause grinding, clenching and other behaviors. In the system of teeth, muscle and joints. If your teeth take the hit during grinding, you likely won’t have any pain, but you’ll start to wear down your teeth. Dr. Woodside is typically the first person who will notice you are grinding. She will look for abnormal wear and tear on your teeth, as well as your joints and muscles. If she thinks you are grinding she will recommend a course of treatment which may include bite splint therapy, and/or tools to uncover potential sleep disorders. What are the side effects of sleep apnea and grinding? What are possible treatment plans? Dr. Woodside is one of a few dentists to treat problems associated with teeth grinding. She will spend time with you to uncover your patterns and behaviors that affect your mouth. If she believes you are in fact grinding, she will recommend an oral appliance. If she believes you may have an obstructive sleep disorder (such as sleep apnea) she will recommend further testing. She has two high resolution pulse oximeter she uses as a screening tool. The tool is worn on your finger and wrist for 3 nights in the comfort of your own home. Upon completion, the information is downloaded in graphic format for Dr. Woodside to interpret. The data will show when you wake up each night, and what your oxygen levels are. Keeping a heathy airway when you sleep is paramount to your health. Upon completion of the pulse oximeter, Dr. Woodside will clearly outline next steps for treatment including a more comprehensive sleep study and/or an oral appliance. We encourage you to make an appointment with Dr. Woodside. She will be able to see signs of grinding and can create a custom treatment plan for you. Dr. Woodside practices comprehensive dentistry because keeping your teeth as you age also keeps you healthy.